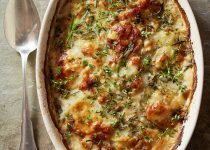 Adding spinach and the cheddar and chive potato seasoning creates a hearty texture and elevates the taste of this side dish. Place potato slices in a large saucepan, and cover with water. Bring to a boil: reduce heat, and simmer, uncovered for 6 min or until tender. Drain well; set aside. Combine milk and next 5 ingredients in a medium bowl, stirring with a whisk until blended. Melt butter in a large non stick skillet coated with cooking spray over medium-high heat. Add onion; sauté 7 min or until golden. Reduce heat to medium. Gradually add milk mixture stirring with a whisk until blended. Cook 5 minutes or until thick and bubbly; stirring constantly with a wooden spoon. Add cheese stirring until cheese melts. Remove from heat. 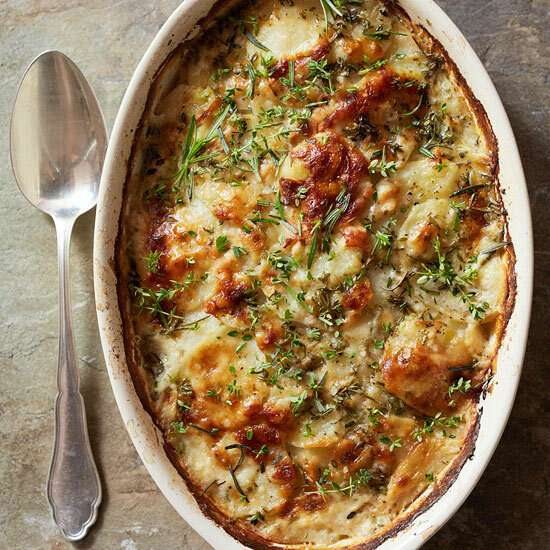 Arrange half of potato slices in an 11x7-inch baking dish coated with cooking spray. Top with half of spinach and half of cheese sauce. Repeat with remaining potato, spinach, and sauce. Sprinkle with Parmesan cheese. Bake at 450 for 15 to 18 minutes or until golden and bubbly.